Many men and women are interested in porcelain veneers to improve their smile, but are unsure if the results will be worth the cost. 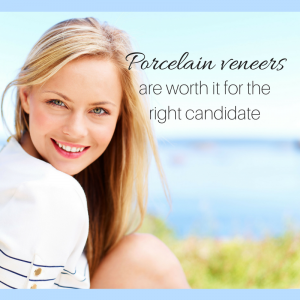 Porcelain veneers, when placed by a skilled and experienced cosmetic dentist, can have high upfront costs, so we understand the hesitation. However, we are happy to say that the vast majority of our patients do find porcelain veneers to be well worth it. If you are interested in learning if porcelain veneers are right for you, don't hesitate to give us a call at 510-795-0444 today to schedule your free consultation. Dr. Jorge Montane will be happy to listen to your concerns and create a custom treatment plan to get you the smile of your dreams. In some cases, porcelain veneers may be recommended in addition to other restorative dental work to make sure your smile is both healthy and attractive. There is no such thing as a one-size-fits-all solution in Dr. Montane's office - each patient gets thoughtful and individual treatment recommendations to ensure the best results possible. If you decide to move forward with porcelain veneers following Dr. Montane's recommendation, you may be worried about their longevity and comfort. Luckily, porcelain veneers last for a very long time as long as you maintain good oral hygiene habits. Veneers are also incredibly easy to care for. As long as you treat them well (no using them as tools or biting on sticky foods like toffee with them) and brush and floss regularly, there should be no problem. Although the upfront costs of porcelain veneers may seem expensive, when you think about how long they last and how well they can fix certain cosmetic issues, they are worth the cost the majority of the time. The process of placing porcelain veneers is also painless, and since the veneers are so thin, they are comfortable in the mouth. If you are concerned about the costs of porcelain veneers, Dr. Montane offers dental financing plans that you can take advantage of. We want you to be able to have the best, most advanced treatments so that you will love your smile, and we will help you to afford them as best we can. If you are interested in improving your smile through porcelain veneers, call Dr. Montane today at 510-795-0444 to schedule your free consultation. We serve patients in Fremont, Newark, Union City, and the greater Bay Area.